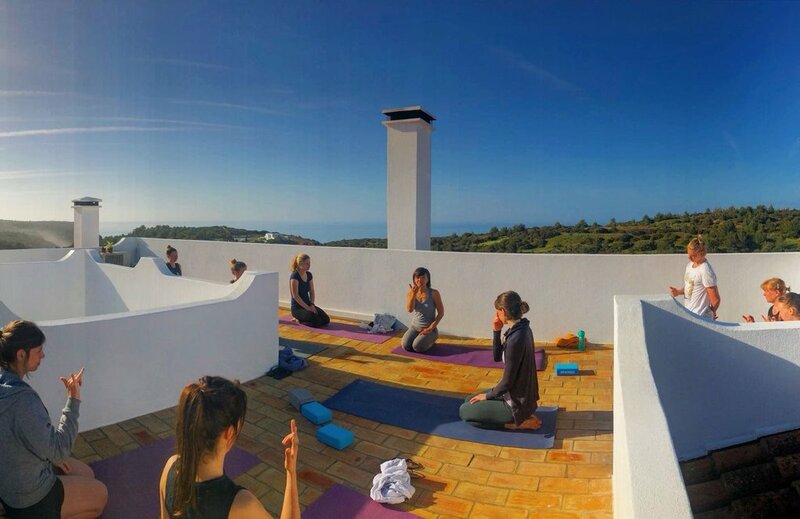 Last year I was lucky enough to be invited to the One Life Lodge in Burgau, Portugal for a Surf and Yoga retreat with Chicks on Waves. 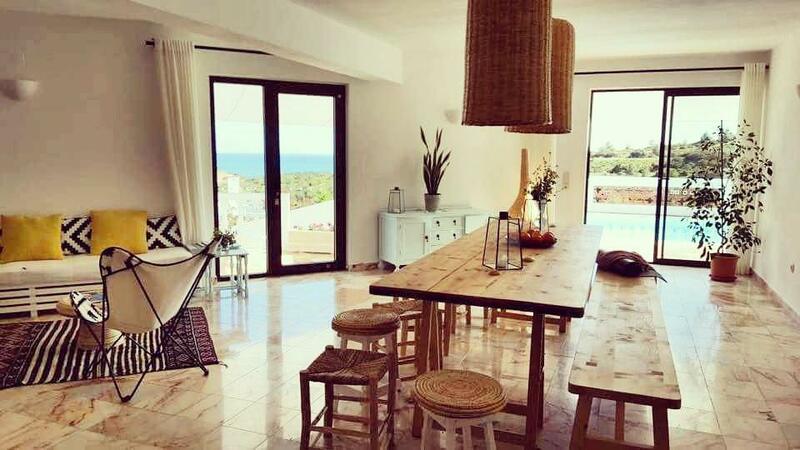 The surf retreat is owned by Belgian born Katrien Kegels and her Dutch husband Niek. 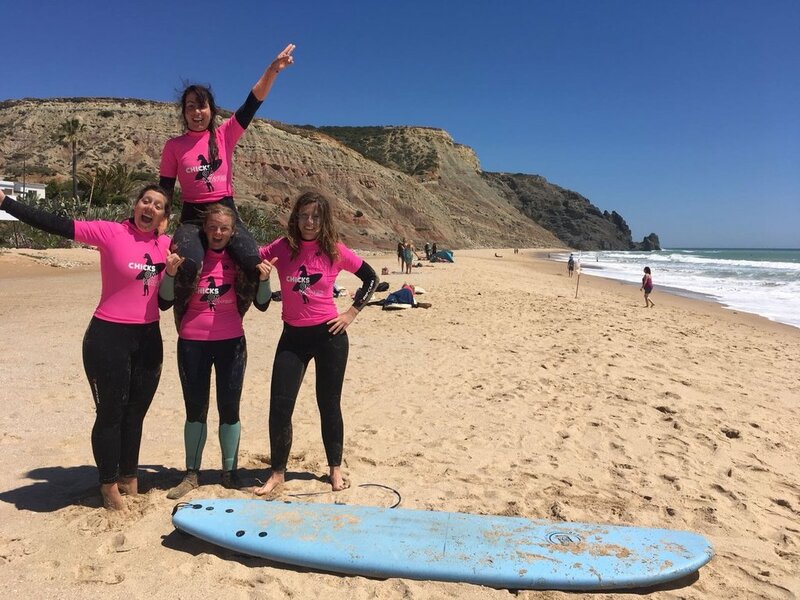 Katrien started Chicks on Waves 10 years ago, organising her first women’s surf week while travelling in Morocco, opening the sport to women and girls in a friendly atmosphere. The ladies loved it, as they kept coming back. 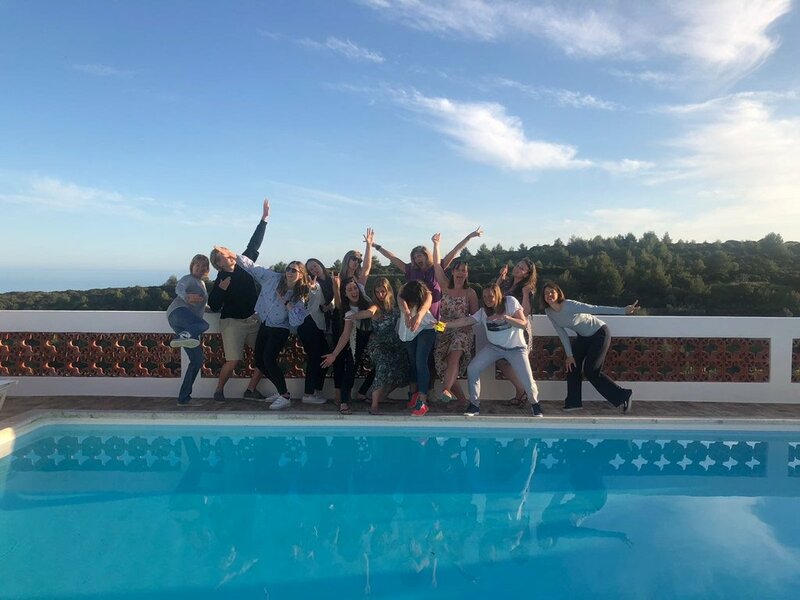 Fast forward to 2019, Katrien and Niek now run the retreats from their stunning villa in the Algarve, South Portugal. When I say stunning, I mean absolutely smashing. From the moment you walk through the door of the villa, you are drawn to the spacious lounges with sea (and pool!) views. A place to relax and for yoga. (When it gets a little chilly on the rooftop.) When I arrived to the lodge for the first time, I was greeted by lodge host Karine’s big smile. As she showed me around there were other ladies, that had arrived earlier that day or the previous day, relaxing and chatting on the many lounge spots around the villa. There was a wonderfully welcoming atmosphere. Guests come from all over the world to Chicks on Waves. 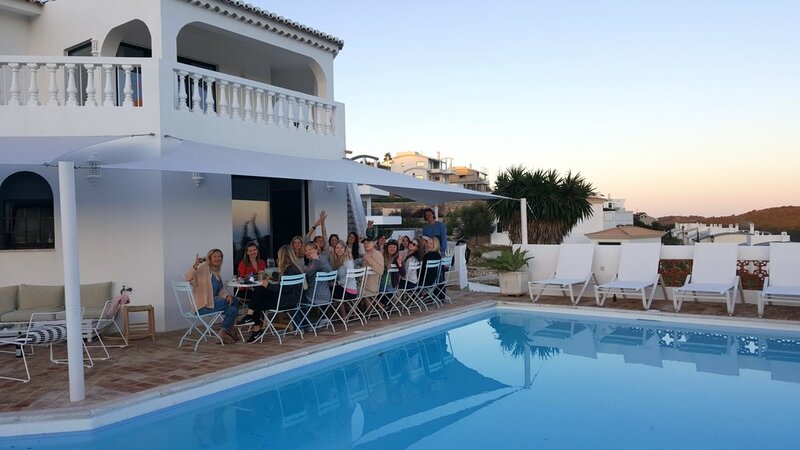 During our retreat, we had 6 different nationalities in our small group and a lovely range of ages, a majority of them solo travellers. Everyone bringing a different life story to the ‘table’, but all some way or other connected by the love of travel, yoga, an active outdoor life and surfing. I mentioned bringing stories to the table, I’ve got to mention that table again, because this is where the group really came together. (You don’t have to surf, you can stay for a yoga-only retreat too, without having to miss out on the group dynamic.) The lodge’s chef, Anina, is so talented in creating heart warming healthy meals. Many smiles and belly laughs followed every meal we shared around the big table. I remember the very funny question rounds over dinner, creating a special connection between an international group of women. It was so lovely to get to know the group a little more as the days went on. One of the major highlights of this whole week for me personally, except for the surf of course, was the total relaxation and peace of mind. I have travelled and worked abroad for quite a few years before settling in Wales, so whenever I went somewhere, there were still always things to organise, book or think about. However, from the moment I stepped foot through the door of the lodge, I had nothing to worry about for the whole week. No food to cook, no dishes to wash, no car to drive, no.. it was all in the hands of the lovely hosts. From breakfast, driving to the surf spots, to lunch on the beach and dinner, it was all there. All we had to do was be there, and if for whatever reason your mind was still elsewhere, daily yoga would bring you back to the moment. The daily yoga sessions were either in the morning or in the evening, the ladies on the yoga-only retreat would have both. Whether it would be a sunrise or sunset session was decided as a group and organised around the best tides for surfing. The rooftop of the lodge was the perfect location for these yoga sessions, and there was a range of yoga styles offered throughout the week. After a day surfing, there was nothing better than a long calming shoulder stretch while listening to the birds singing their hearts out. We surfed many different spots, sometimes two in a day. As the swell was pretty big on the west coast, the instructors decided to find some sheltered spots on the south coast. This is definitely an advantage to the lodge’s location, there are so many spots to choose from. There will always be surf somewhere. Our group was a real mix of surfing abilities, so we had 2 instructors, providing for every ability. From seasoned surfers to the very first-timers. By the end of the week, every one was gliding away with a big smile. It’s no surprise that women keep coming back to this place. The quality of every aspect of the retreat is so high. Owners Katrien and Niek will be around the lodge every day, making sure everything is top notch and every one is happy. The weekly BBQ, where Niek is in charge of the fresh fish is such a lovely occasion too. Both Katrien and Niek and their whole team are very approachable and try to make time for every one, from a nice chat about life to taking you surfing at their favourite local spot. I can’t recommend a stay in the One Life Lodge highly enough, it’s totally worth every penny. If you time it right, return flights to Faro can be cheap as chips, and car rental from £4 a day!! 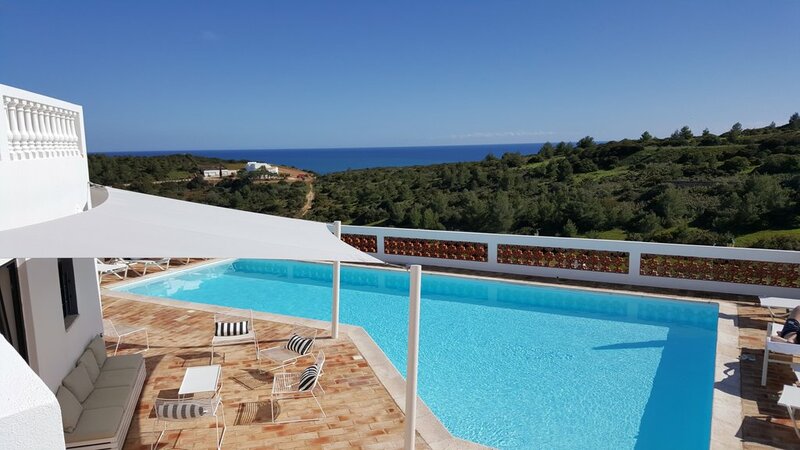 This probably being the easiest and cheapest way to get to the lodge which is about an hours drive from Faro airport, but trains, busses and transfers are also available. Flying with boards didn’t cause any problems, due to the surf-orientated destination.